My workshop is in my basement (sigh)...it’s grown to the point where I NEED to figure out a way to minimize dust. Right now I’m doing the ‘ol run a shopvac near the tool while I cut then sweep the floor plan. I don’t mind spending a few hundred…something like a HF system or one of those ceiling mounted collectors…I’m not sure the best way to hook up the hoses and elbows so I’m not tripping over stuff. 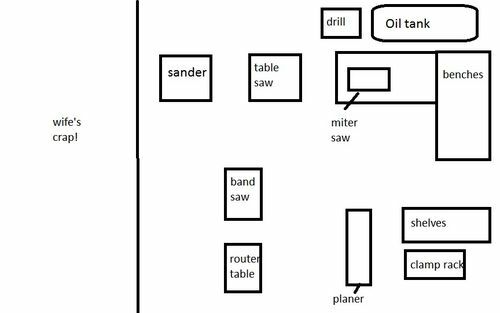 Here is a rough layout…everything is on wheels so I can easily rearrange if need be. Any tips/suggestions? Some people either cut a 4 inch port on the bottom tier area of the bandsaw or mount a shop vac hose port under the table close to the blade . Look around see what is best for you. thanks guys…this is going to be way simpler than I thought. that dust right “start pack” has pretty much everything I need. I only need to buy an additional 2.5” port and a large hood. if I ever feel the need I might run dedicated lines to some machines but I’m not in the shop THAT much. one more question…how “stretchy” are the stretchy hoses…like if I unhook it from the machine will it shrink itself back up or do I have to “help” it…just wondering how to store it all neatly when not in use. again sorry for all the questions I swear I’m not this dumb in real life! Not sure what you mean by hood? But bandsaws pull chips and dust downward following the front of the blade. The Dust Right and the Harbor Freight wall hung dust collectors have a woefully inadequate filter bag. They really should be called shaving collectors. You need a filter that captures at least down to 1 micron particle size with 99% efficiency.The Rockler filter bag captures 30 micron particles and up. These units unmodified will help you reduce the amount of shavings and sawdust on the floor but will not protect your lungs against fine dust. My opinion of the shop air filters is they aren’t worth much. One study I saw determined that the particulates in the air were filtered down to safe levels 30 minutes after the machines stopped working, even though the air filter ran all the time. What that means is your filter and your lungs are filtering at the same time. I think the only really effective way to cut down on the dust in the air for health reasons is to intercept the dust at the source.